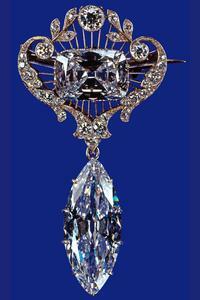 Both the central portion of the top brooch and its pendant are pieces from the famous Cullinan diamond. Cullinan VIII is the emerald-cut 6.8 carat diamond on top, and Cullinan VI is the 11.5 carat marquise diamond that serves as a pendant. The top portion alone also serves as a part of the Delhi Durbar Stomacher. The brooch was left to the Queen in 1953 by Queen Mary, and though it is used, it is not as common a sight as Cullinan V, its heart-shaped counterpart.